Biosensing Instrument Inc supplies high performance and cost effective surface plasmon resonance (SPR) instruments for the study of biomolecular interactions. BI’s new SPRm 200 is the world’s first commercial SPR Microscopy, which integrates optical imaging and SPR technology to enable label-free in vitro measurement of binding kinetics of membrane proteins. 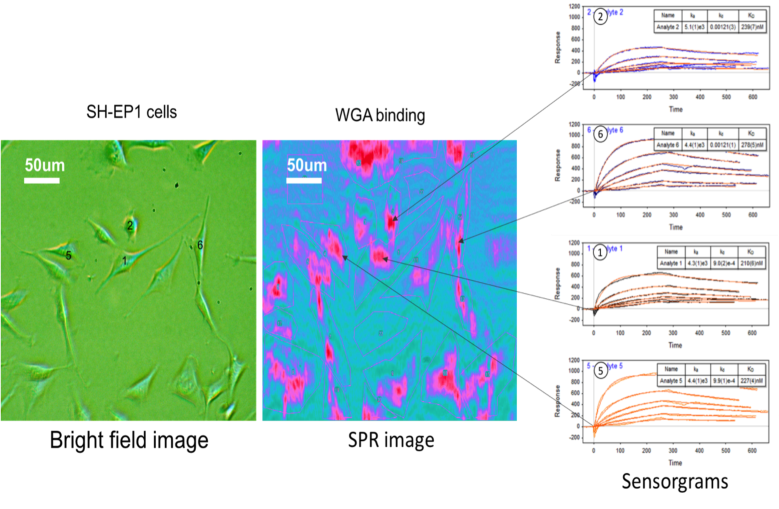 SPRM system combines both optical and SPR microscopies thus enabling the unique in vitro binding kinetic measurement of individual cells in their native environment. The architecture of the system consists of using the SPR phenomenon to measure binding kinetics while also simultaneously permitting use of bright-field microscopy to study topographical and phenotypical changes in the sample. Bright-field and SPR microscopies in one instrument. Large field of view with high resolution optics to view single or multiple cells. Provides SPR sensorgrams and binding activity map of individual cells as well as the binding kinetic constants (ka, kd, KD). Nanomotion detection study of bacteria or virus metabolic activity or binding activities of nanoparticles for drug delivery designs. The picture below shows the bright field image of some cells and the corresponding SPR image. By following the interaction of selected regions in time classical SPR sensorgrams can be measured. Read the application note about the SPR microscope for more information. or visit the Biosensing Instrument website.